Wooo Hooo! It's Pink Saturday! I am so excited about my new purse. And, I owe it all to YOU!! A few weeks ago, I showed this as an unfinished project. And, to be quite honest with you, it was filed away in my REJECT pile!! I just couldn't envision a finished result. After posting it for Pink Saturday, I received some wonderful comments encouraging me to finish it....thank you!! 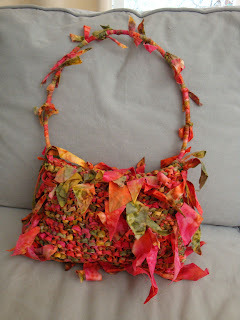 The pattern gave some terrific tips and tons of info. Mine isn't exactly like the pattern, so we shall say that it is "inspired" by the pattern. I've worn it all week and I keep getting compliments....YAY! 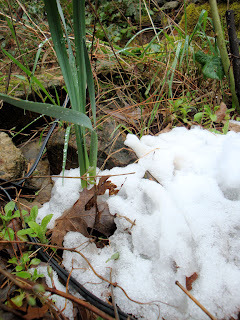 Just what I needed to feel "springy"! 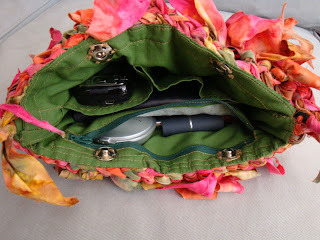 And, LOTS of pockets! I even put in a zipper. I learned how to do this at U Handbag. The handle is some plastic tubing that is in the plumbing section of the hardware store. I simply covered it with fabric. This is my own original idea. 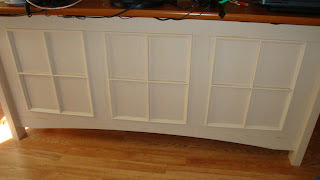 It's a very affordable solution to handles. I love it so much, that I have another one on my needles right now. I'm trying to make this new one more like Heather's....but my projects seem to take on a life of their own, know what I mean? 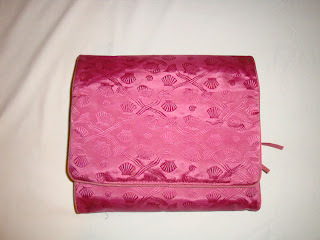 So, thank you to all of my Pink Saturday blogging friends....thanks to YOU, I have a wonderful new purse! Now head on over to Beverly's and take the FAMOUS Pink Saturday tour! My New Throw is here!! Well, at least it WILL BE....I have to make it first!! Don't you just love those colors?? 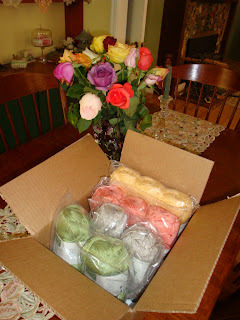 And, this yarn is soooo soft! I can hardly wait! This is what it will be when it's done (hopefully!). Question. Do I finish the 2 projects I have on the needles right now.....or do I DROP EVERYTHING and go for the new and exciting project???? Hmmm. Compromise. I will finish at least one of those 2 projects before starting the new one. Fair enough? How are you coming along with your "list"? Did you make one on New Year's Day? I make a new "list" every January. I guess you can call it New Year's Resolutions. I prefer to think of them as goals. Seems like many of the same things show up each year. Does that happen to you? It's okay you know. You just keep putting those things on your list and one of two things will happen. Either you will eventually do the "thing" or you will decide that it wasn't really important to you after all. This has been on my "list" for a long long time. 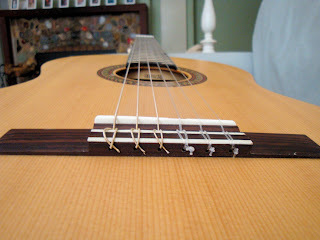 I had a guitar as a young girl. My sister and I got them for Christmas. I learned a few basics. And, in all those years that passed by since then, I always thought I would one day get back to it. That is why it has been on my list over and over. 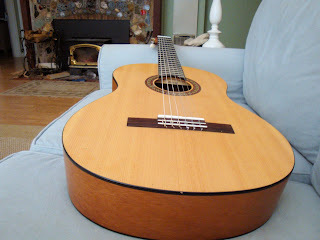 Two years ago, hubby bought this guitar for me for Christmas. Wasn't that sweet? He is a good guitar player, so he knew how to pick out a good one! You would think that this would get me going....alas....no. It went in to the closet. However, I still put it on my "list" of things I want to do. Then as fate would have it, I was talking to a friend and she told me about a class. It's only $5 and it's a drop in every Monday. Does it get any easier than that? I was soooo excited! I got dressed and ready to go at least 4 times....but I did NOT go. Why? I don't know. I just "chickened out". I just couldn't bring myself to show up. New people, could I do it, am I too old? Or was it ....just plain old fear. Eventually, I showed up. I had a wonderful time! The teacher is terrific. He makes everyone feel so special and talented. He also makes learning fun!! 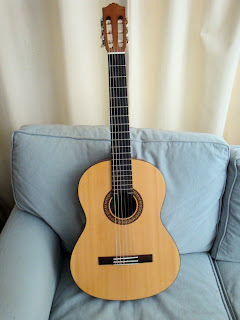 It's been a couple of months now, and I can actually play a song or two (it's rough sounding...but getting better all the time!). My hubby has joined the class too, so now it's something we can enjoy together. And, he is a really good guitar player already. Today I was glancing up at my Vision Board. Do you know what that is? It's a display of things I want to accomplish or have in my life. You gals that are so creative would make it a work of art. Mine is simply a bulletin board filled with cut out images from magazines. It's jam packed with clippings and words. It is directly across from my desk and I see it everyday. 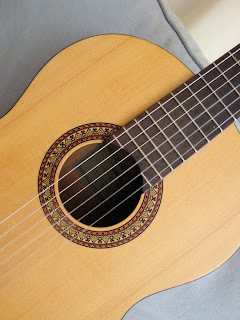 Today I noticed the picture of a guitar. It's actually a person playing guitar and I pasted a photo of my face over theirs. Wow. 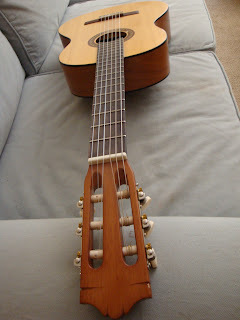 That guitar looks just like mine! Co-incidence? Then I started gazing at the other pictures and I was amazed at how many have actually come to pass. It is almost uncanny. There is a picture of a porch that looks JUST like mine! There is a garden tent that looks just like mine. There are sooo many things that are on my board and ALSO in my life! I still have plenty of things yet to accomplish or have. That is something to look forward to. This summer, when we go on our annual family camping trip, we will be able to play our guitars and entertain our granddaughters. And, that's going to feel wonderful! One of my mentors challenged me to write 200 goals in January. Today I went looking for that list and I found it. I had only gotten to #64! And, THAT was hard. Even though it's only been a few months, I think I could add quite a few. How about you? Do you have a list? A vision board? A mentor? What do you want to accomplish in your life? What things do you want that you don't already have? It's Pink Saturday and I am here to report on my Perfectly Pink Birthday! My first present was from my husband. He took the day off just to spend with me. He chauffeured me around my favorite shopping spots, wasn't that sweet? My first stop was the post office and this lovely gift was waiting for me. 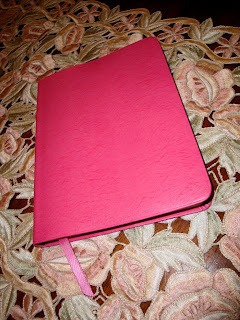 My dear friend, Emily, sent me this lovely PINK journal. Emily and I have formed a wonderful friendship that I cherish....and how did we meet you ask?? Why, we met at Pink Saturday! So, this gift had special meaning. I'm certain that that Pinkness of it was completely with purpose!! Thank you Emily!! One thing that I was truly looking forward to was eating Birthday Cake. 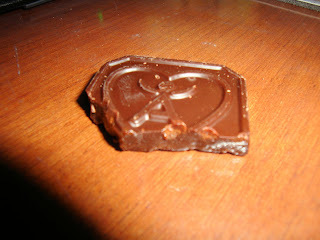 I'm certain that if you know me at all, you would know that this is my favorite treat!! Here it is.....and I didn't even request Pink Roses. It's like they knew!!! 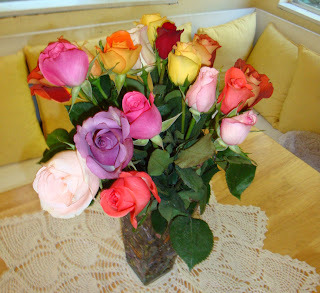 Hubby let me pick out flowers from him. Aren't they soooo pretty? All these wonderful colors. There are several PINK ones!! Yes, the day was Perfect. Dinner with family, lots of laughing and fun. What's better than that? 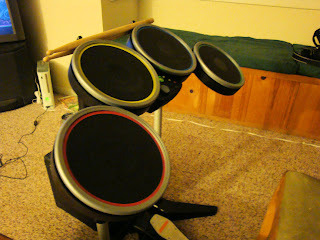 And, to top it off, we were invited to the "kids" house (that's what we call the newlyweds) to play "Rock Band". Hey, I may be 50....but I can still "Rock Out"!!! 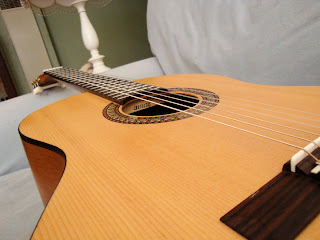 And, in honor of my special day, I got to choose my instrument...guess what I picked?? Yes, it was a Perfect Day. One of those I will always remember. And, it wasn't over yet. At night, I like to do a "last call" on my email. And, I happened to peek at my blog comments. 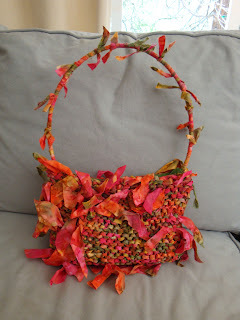 Debi from http://lifeinmystudio.blogspot.com/ left me a comment to "hop over to her blog" she had something for me!! Oh my gosh....she made the most wonderful post for my Birthday. 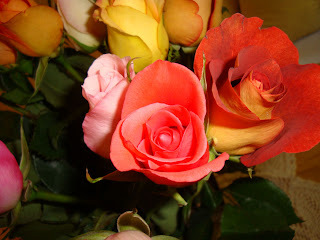 I was so touched by her thoughtfulness, I can not even tell you!! I have always enjoyed her blog so much. Isn't that just the PERFECT ending to a Perfect day? Thanks Debi!!! 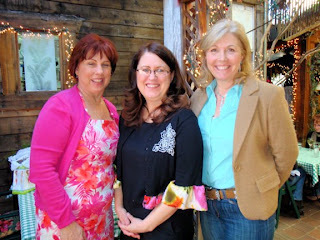 And, this birthday just kept going..... the next day I was invited to lunch with 2 wonderful friends, Lynn & Lynn! We had a yummy lunch at Susan's Place. It's a very special restaurant in Sutter Creek CA. There must have been 4 other birthday lunches going on at the same time! 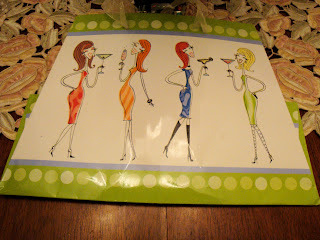 This gift bag is exactly how I felt about the 3 of us!! Fabulous Darling!! Don't we look like we're having a great time?? This was a special gift from Lynn, sweet sayings about Friendship. 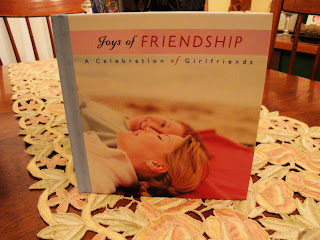 Yes, friendship is a "Joy", isn't it? I want to say thank you to whoever came up with the idea of blogging. It's been a wonderful thing in my life. I've met just the best people here in blogland. People that I call "friend". There are more friends waiting for you..... at Beverly's. 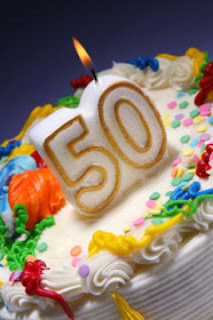 Because today I AM 50!! Hubby says I can do whatever I want today...so he is taking me shopping!! Well...do you like being the center of attention? My Mother in Law is turning 80 in April. I wanted to throw a BIG party for her, invite everyone who knows her etc. She was SO uncomfortable with this idea. For a while I pressed the issue, and then I realized that instead of honoring her and doing something nice for her.... I realized that I was in fact "torturing" her instead. You see, she does not want to be the 'center of attention'. I put on my 'patience hat' and told her that her party would be exactly whatEVER she wanted it to be. And, it's going to be small. 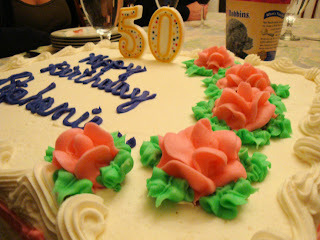 Tomorrow is MY birthday....the big 5 0 ! I can tell that my husband and my daughter are conspiring, lots of whispered conversations. People are asking me "what are you doing for your birthday?". They want to hear about a big party or some such. No. I just want to do what we ALWAYS do. Dinner, cake and ice cream with my family. "Are you sure? ", my family wants to know. Oh Yeah. I'm sure. I don't want to be the "center of attention". Ding Ding Ding! Yep, a bell went off in my head. I finally understood why my MIL was balking at my big party idea. I guess we have that in common. What do you say when someone asks you "What do you want for your birthday?". I don't want anything. I'm at that age and stage in life, where if I want something, I get it (within reason). And, I don't want to ASK for anything...it's that "attention" thing again. One thing I DO want and have told ANYONE who will listen....is a BIRTHDAY CAKE! I've been cutting calories for a week in preparation!! I want to eat cake until I'm stuffed!! I wanted to order just the right cake, so I called and ordered it myself. The lady says, "what do you want written on it? ", I said "Happy Birthday Stephanie" (that's me!). Then she said "And YOUR name?". Hmmmm should I make one up? No. I said "Stephanie". Wonder what she thought about that? So, how about you? Do you long to be the center of attention? I used to have coffee every morning. It was my ritual. I felt like I needed it to wake up and start my day. I came across things every so often that made me think that coffee wasn't such a health way to start the day. Could that be true? When I first found my Nutritional Cleansing Program, I gave up coffee for a week. Well, it just never tasted good to me after that. I still have a cup every once in a while, but the morning cuppa ritual was over. Now, I have a NEW morning ritual. 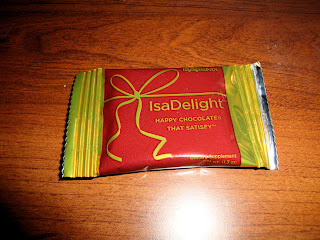 I have an IsaDelight. Mmmmm. Just typing the word makes me want one!! 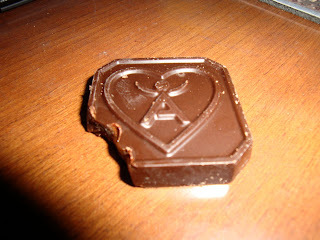 This is a yummy dark chocolate from my company. From my very first bite, I was hooked. 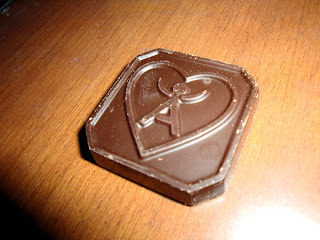 And, I am not a "chocolate" person. You may be wondering WHY I would want this as my morning ritual, yes? 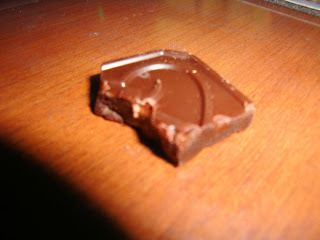 First thing....it's called HAPPY Chocolate for a reason. I notice that in about 12 minutes after eating this, my mood is vastly improved! If I am super grouchy....I will have 2!! 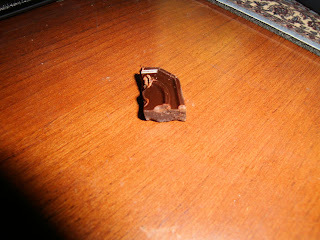 Can you imagine having a happy mood just from a small piece of chocolate? Second thing is....energy. Not the hyped up stimulant type of energy that I used to get from coffee, it's the good kind of energy. I just feel more focused and I manage to get more things done. And, that's a wonderful thing!! 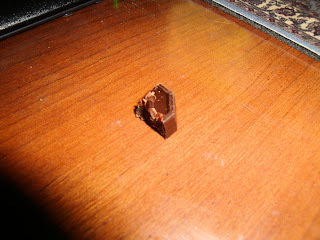 The Third thing this little treat will do is.....decrease the appetite. And, it REALLY does this! I'm not hungry after eating it and when I DO eat....I want to eat LESS food. That's pretty handy, dontcha think? I'm a "clean my plate" kind of gal. I just LOVE to eat. What can I say? These come in handy for me and keep me from over eating. Yay!! What? Why? How? Yep, it's not just "chocolate". It has HEALTHY things that are in there that work on the brain....brain "food" I guess. I can tell you that everyone I have shared them with, falls in LOVE with them. 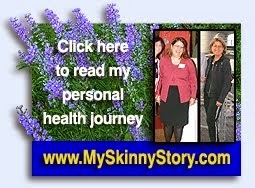 If you would like to check it out, you can visit my website and watch a short video that explains all about it. If you would like to buy some, please let me know....I can save you money! In fact, just leave me a comment with your email and I will get your address and I will send you one to try for yourself (just in case I get too many.....let's limit this to the first 10). This is a jewelry organizer that I have had forever. Probably since the 80's. I was having trouble seeing my collection of beads for making jewelry, and I found myself buying the same exact beads over and over. (hey I know what I like!) I was looking for a way to organize them and to be able to see the colors that I have. This was the perfect answer! I can see all the colors. 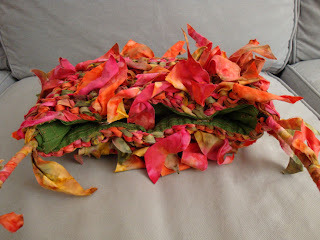 Of course, when I am making things, I always want some color or size that I don't have, lol. If you are thinking that this is a lot of beads....think again. 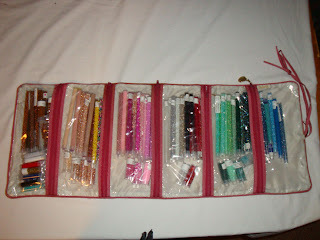 I know what other "beaders" have and this would be considered a "beginner" collection for sure. I'll just have to work on that!! Yes. I do LOVE pink! 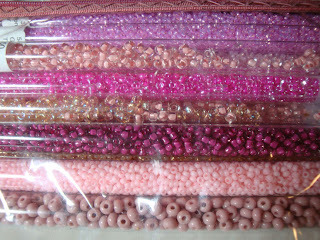 I sometimes think that I enjoy collecting and organizing the supplies even more than the actual creation of jewelry!! Warning! If you are not easily amused.... This post will POSITIVELY bore you. There. At least I warned you. He he. First of all, I did not get to play in the sewing room yesterday....I was recruited to PAINT for our "project". I really don't like painting, but somebody had to do it. Today I am putting my home office back together. I can't wait to give you the whole tour, it's one of my favorite places! 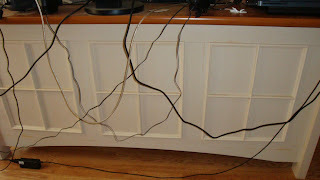 What's up with all these cords? Yuck!!! I just couldn't leave them like that, could I? I found some of those stick-on hooks and hid them under the desktop. This is what you DON'T see around the corner of the desk. Ugh. I don't EVEN know what to do about this. Nothing I guess. Nobody can see it except for me. As I started to put every thing back together, I came across these. What the heck? 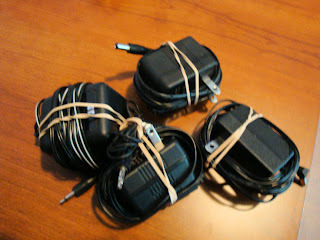 I'm that person who is always telling people to label all of their cords. I don't have a clue what these go to. Wait! One of them goes to my Beautiful Crystal Award that my company gave me 5 years ago when I became a Crystal Executive. It's very special to me. It lights up and turns around showing off the crystal. So. Which plug is it? The crystal base doesn't have any markings on it. 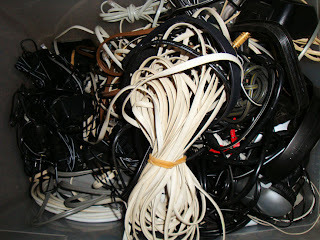 These are just the everyday cords that I keep in my top drawer. 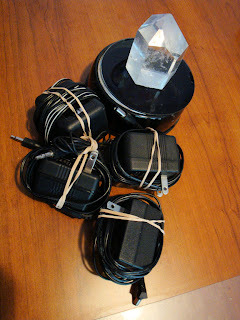 They are for my Ipod, camera and cell phone/pda. Yesterday, I was looking for a cord to plug in to something old. I asked hubby if he knew where it was. He brought out his box of cords. You would NOT believe this unless you saw it. It had obviously been rummaged through many times and it was one big snarl. 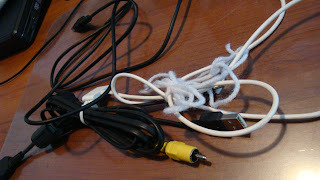 On a good note, I found the cord I was looking for, this involved a quick call to Radio Shack for confirmation. They are soooo helpful. 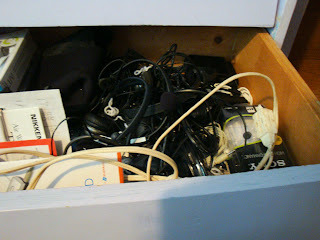 Admittedly I have my own cord "cache". I have tried and tried to keep it organized. Those cords, just LOVE to mingle. 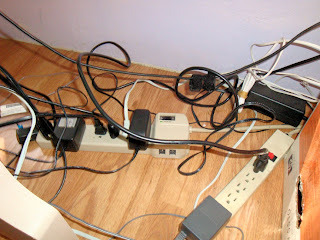 No wonder the house goes so quiet when the power is out. Just think of all of these things that are ALWAYS plugged in! 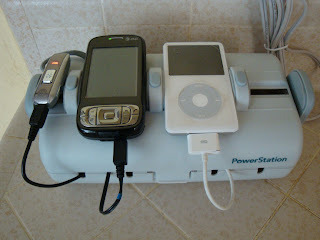 I USED to have a bunch of cords in my kitchen for all the chargers. Then I found this little station. I bought it years ago and never even took it out of the box. Wow. It really did come in handy. Isn't technology AMAZING? We are so lucky to be living in such an incredible time. Sometimes it's hard to just keep up.